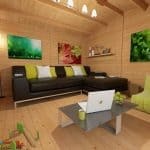 This is a good-sized cabin that seems to have been designed to bring a little individuality and a level of personal choice to the consumer. This is no bad thing of course, and a refreshing change in an industry that has plenty of standard sizes and choices. Here you get some customisation on the flooring for example, as well as a number of other decisions that you can make about the look, and the overall practicality the building has to offer. 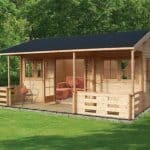 It’s a great feeling to be able to change and adapt a building to suit your garden, and this cabin delivers well on this front. This building would make an excellent home office. That is one of the first things that springs to mind when you see it. It has plenty of light, and the space inside the building would welcome a desk, chair, and various office paraphernalia. 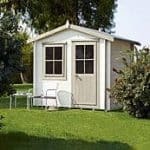 There is also scope here for a building that can be used as a second room or other room in addition to the rooms you already have in your home. It brings you plenty of space, basically. Like other buildings from this manufacturer, you have glazing options. You can choose between Georgian glazing, which is nicely traditional in it’s looks, or more modern glazing. This of course depends on your own personal taste to some extent. But because you can also choose between single and double glazing, it makes for quite a decision if you weren’t sure when you first considered the building. The double glazing choice obviously has real attraction during the winter, and whether you live in a noisy area or not, you will appreciate the enhanced noise reduction this thickness provides. However, the single glazing option seems to be no pushover, with toughened glass included to give you an extra level of protection. The manufacturers have seemingly thought of everything, even planning. With a number of projects being halted due to planning restrictions, it is nice to see that the company has created a product that is intentionally below 2.5 metres in height. 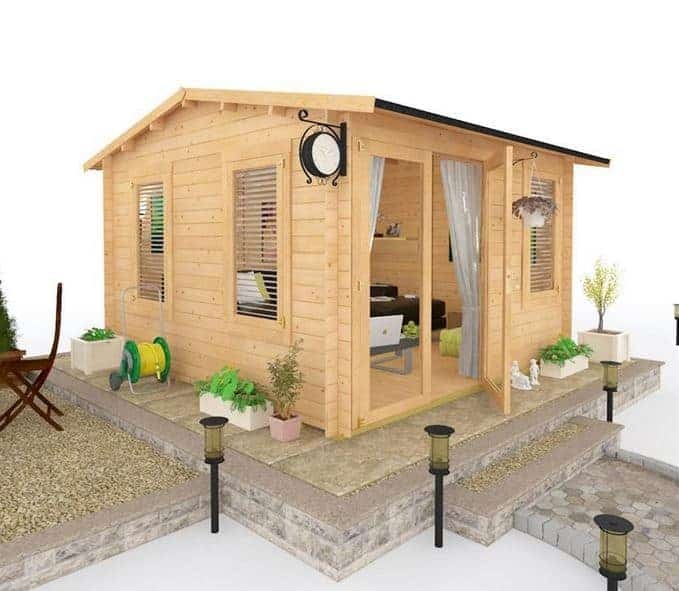 This gives you the peace of mind that comes when you know that the building will not fall foul of any planning regulations on height at least. They have made a big deal of the heights and measurements, and this is typified by the fact that the double doors on the building are 6ft 2’ in height. 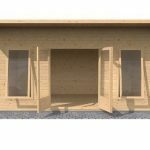 This allows the majority of the populace easy entry to the building, and reduces that need to stoop to enter a log cabin. 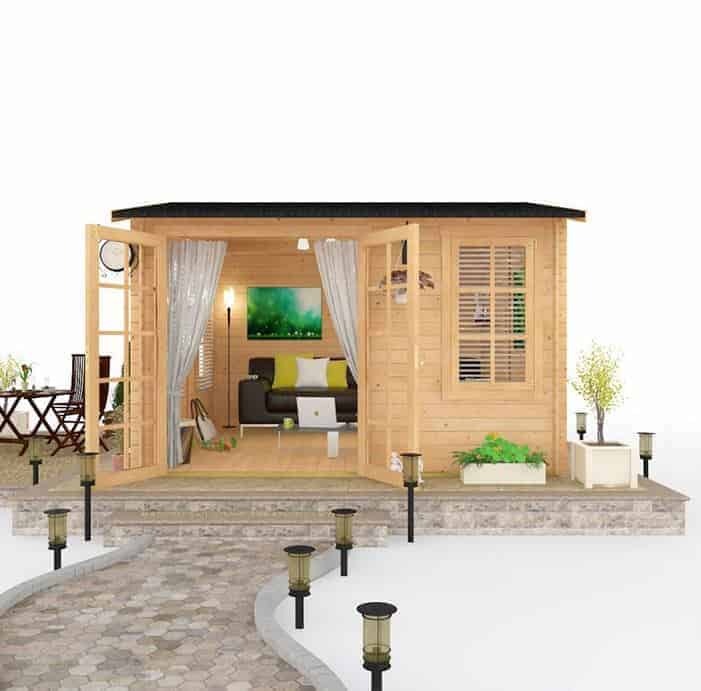 The cabin comes with a timber thickness in the walls of 19 mm. This is thick and sturdy, and gives you a strong building. The 19 mm goes a long way, and is definitely thicker and stronger than the majority of walls out there right now. You also have a building that has tongue and groove interlocking boards on the cladding. This is strange stuff if you haven’t seen it before, but it is also very high quality. The tongue and groove brings you very strong cladding that locks together, keeping out any rainwater for example. But that tongue and groove also ensures that the cladding is not prone to wear and tear. 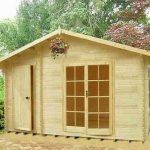 The two panels, one a ‘tongue’ and the other a ‘groove’, lock solidly, so you have a stronger and more durable building. Three windows are there to bring that huge amount of light we mentioned earlier, and double doors open up wide to give you full access to the interior. All in all, you’d find it hard to be unimpressed by this large building. So what does it come with? The pack that comes with the building is full of stuff that you will need to get your new cabin up and running quickly. All the walls for the building come supplied in the pack, as does the tongue and groove roof. The tongue and groove work in the roof is the same that is used in many high-end buildings. It is more expensive to create and fit, and this shows how it is a higher quality roof. The tight interlocking of the tongue and groove work means that you have a naturally resistant roof when it comes to rainwater. It’s also tougher than other materials too. The fixings you need to install the roof are all supplied a part of the pack. What else do I need to know about the roof? You can opt to have a mineral felt roof, which is basic roof covering, or a shingle roof. The shingle roof material is not only visually striking it is also much stronger and therefore a much better option. It is more expensive than a felt roof but definitely worth the extra outlay if you can afford it. 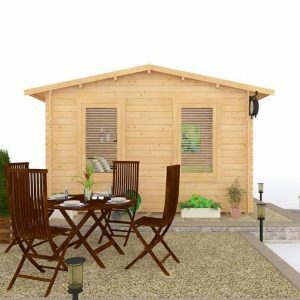 BillyOh Derwent Log Cabin: So what’s the quality like? We like the tongue and groove work, especially in the roof, where it makes a real difference to the longevity of the building. Pair up that tongue and groove with the shingles and you have a considerably stronger and more durable roof than others. A high quality building, it is enhanced greatly if you go for some of the bells and whistles. Investigate having a shingle roof and you should find that your building is strong and tough enough to last for a very long time. 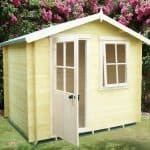 The building is roomy and perfect for that home office you have been promising yourself for years. It is also arguably big enough to present as accommodation in it’s own right.